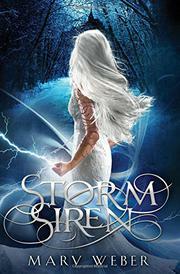 A slave girl struggles to control her supernatural storm-bringing power in this series opener. Seventeen-year-old Nym causes lightning strikes that kill those who make her angry, but they also inadvertently kill innocents. Adora, a powerful noblewoman in the kingdom of Faelen, witnesses Nym’s power and buys her for use as a weapon in the ongoing war against Bron, which Faelen stands in imminent danger of losing. Even as Nym submits to her enslaved status, she remains defiant, especially when Adora orders her to work with a handsome trainer, Eogan, to learn to control herself. She and Colin, a boy who can cause earthquakes, work together. Nym also forms an attachment with Colin’s blind sister, Breck, working as a servant in Adora’s household. All of these characters come together in the final (for this installment) battle to save Faelen and one another. Weber builds a fascinating and believable fantasy world, inventing epithets (“Teeth of a pig, what the litches was that?”) and combining medieval and modern elements (a feudal system and antibiotics, for instance). Her characters’ paranormal powers work well, and she weaves in just enough mystery about each character that they all remain interesting. The story ends with a gutsy surprise that many readers will find unusual in this genre and that leaves them poised for the next volume.